The new EP from San Francisco’s Birds & Batteries, Up To No Good, is misleading — it’s up to something good, really good, in fact. While many bands fear change, preferring instead to stick with a system that works, Mike Sempert (vocals/guitar/keyboard) continues to experiment. The album has a sound — with electro, alt-country and other elements — that is difficult to label. Sempert spoke with SF Station about the EP and the new direction for Birds & Batteries. SF Station (SFS): How did you choose the name Birds & Batteries? Mike Sempert (MS): It came from a Tom Robbin’s novel I read, “Still Life with Woodpecker.” The words were juxtaposed together and I liked it. It’s just a phrase or a sentence in that book. SFS: Have you ever had anyone confuse you with The Bird and The Bee? MS: Yeah, that’s happened to us. There are a lot of bird bands. MS: “Wolf” is the new “bird.” There was a New York Times article about SXSW a couple years ago about all the animal bands. The invasion of the animal bands; we were mentioned in a batch of a thousand bands with animal names. SFS: So, is music your main gig now? MS: More or less. It’s not lucrative, but it is my entirely livelihood. SFS: That is not always easy. MS: It’s not. It’s kind of scary actually, but It’s good. I feel like now is the time to do it. SFS: You have described your album as a “spooky-funky adventure.” Can you describe a spooky-funky adventure you once took? MS: I went swimming once, late at night, by myself at a lake. It was completely black. When you swim late at night, the difference between the air and the water is sort of disorienting and terrifying. So, I was spooked there once. SFS: How was your album a spooky-funky adventure? MS: Well, the process of making it took a really long time. I feel like when you’re really close with a project, and you’ve been working on it for a really long time, you kind get into the dungeon working on it everyday and start to lose perspective and get a little crazy. SFS: The production on the album is really clean, were you working on it in a studio or at home? MS: It’s sort of a hybrid of a home and studio project, which I think how a lot of people do it nowadays because studio time is expensive. It’s funny because our next record will be a look in the opposite direction — a little rougher around the edges and not as clean. SFS: I’m a little perplexed because your sound is really evolving. With this EP you’ve received a lot of positive feedback, and you’re now going in a different direction? MS: It’s potentially problematic because I think we’ve gotten some nice love for the EP. I think people might be expecting certain things on the next record, which they might not get. The EP itself wasn’t like “this is the direction were going in the long-term sense.” It was just to explore a batch of sound, and a production style for one EP. I feel like we accomplished that and now we’re on to the next. It’s sort of the only way I know to not feel limited by a genre or style, and just to do what the music calls for. SFS: So tell me about this direction you’re going with the new album. MS: Another reason that it’s sort of hard to see it as two different directions is that the EP and this new album were recorded at the same time. Originally, both the “Villian” and “Out In The Woods” were going to go on this full-length. Then I started writing these offshoots songs like “Sneaky Times,” and “Lonely Guns.” I started seeing a narrative, and an opportunity to cut things off and go with that. SFS: What is the narrative? MS: There is sort of a protagonist, who I refer to as the villain. Essentially, this sort of character connects with a lot of questions of morality that we see especially in the corporate world. A lot of songs were written before the economic crash, but I think it ended relating toward that as well. So, “Out In The Woods” is this character fleeing the crumbling civilization and losing his mind. “Sneaky Times” is again about this character. These are guidelines, it isn’t anything concrete. SFS: Up To No Good seems darker and sonically lusher than I’ll Never Sleep Again. What were some of your influences or reasons for these changes? MS: I think we live in really fucked up times. I think I’ll Never Sleep Again has certain optimism to it, and Up To No Good is my release in whatever sort of darkness you might find that it is, and hopefully a bit of irony and a bit of tongue-and-cheek humor with a title like “Sneaky Times,” because sneaky times is just fun to say. It’s vitamin-D dark, whereas I’ll Never Sleep Again is serious with a sort of optimism. SFS: When you’re not making music, are you up to no good? MS: Yes, yes of course. 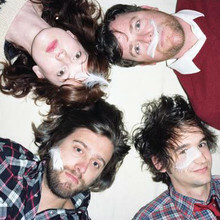 Birds & Batteries perform at The Bottom of The Hill on January 23rd. Tickets are $10. The show begins at 10pm.